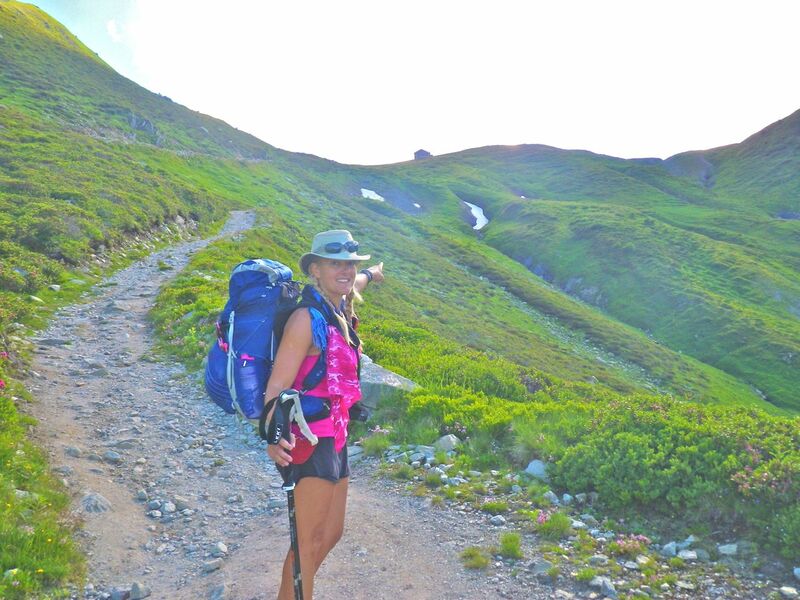 Prior to attending the Adventure Awards in Livigno, Italy at the end of July, Tammy Zakuto, a schoolteacher from Doylestown, Pennsylvania and I backpacked the Tour du Mont Blanc, a 105 mile trek in the Alps, that goes around the highest mountain in Western Europe and through France, Italy and Switzerland. We documented our journey, shooting short films focusing on lessons learned through adventures, including geography, history, math and science. Our goal is to inspire kids to get excited about learning, exploring the world and seeing first hand the things they read about in books and on the Internet. The Tour du Mont Blanc is said to be one of the most beautiful treks in the world. Ten thousand people hike it each year. I wanted to find out for myself and I can tell you, the TMB does not disappoint! The 105 mile (170 km), famous circuit goes around Mont Blanc, 4,807 m (15,771 ft.) the tallest mountain in Western Europe. The trail weaves through three countries – France, Switzerland and Italy – up and down 11 passes and with 10,000m (33,000ft.) elevation gains and losses, the equivalent of climbing up and down Mt. Everest. It is a thigh master workout worthy of a Suzanne Somers’ infomercial. For fit people, the TMB is traditionally done during the summer months, in eleven days, going anti-clockwise and starting from Les Houches in Chamonix Valley, France. Another good starting point for the TMB, and less crowded, is in the mountain town of Courmayeur, Italy. It is here that my friend, Tammy Zakuto and I set out on our Alps adventure. Instead of eleven days, we did it in nine and sampled the various sleeping options along the way. 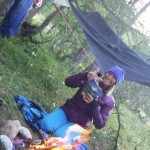 Depending on budget and resources, backpackers can camp, stay in refuges/rifugios, bed & breakfasts, local hotels, sometimes called gites and dortoir. Lodging averages 50-60 Euros a person, per night, including breakfast and sometimes dinner. An official campsite, with bathroom and shower facilities, runs 15 Euros a person, per night. Each of our Osprey backpacks weighed about 30 lbs. In them, we carried, hammocks for camping, Thermarest sleeping pads, sleeping bags, silk liners, ponchos, base layers, rain pants, extra socks, ultra-light weight down jacket and shell, bathroom necessities, first aid kit, a Jet Boil stove, two liters of water and three days worth of food. Food is readily available along the trail. Realistically, you only really need to pack snacks and a lunch each day. Your backpack’s weight will depend on how much you want to carry. Also, if you are not camping, you don’t need a tent or hammock, sleeping pad or cooking gear. 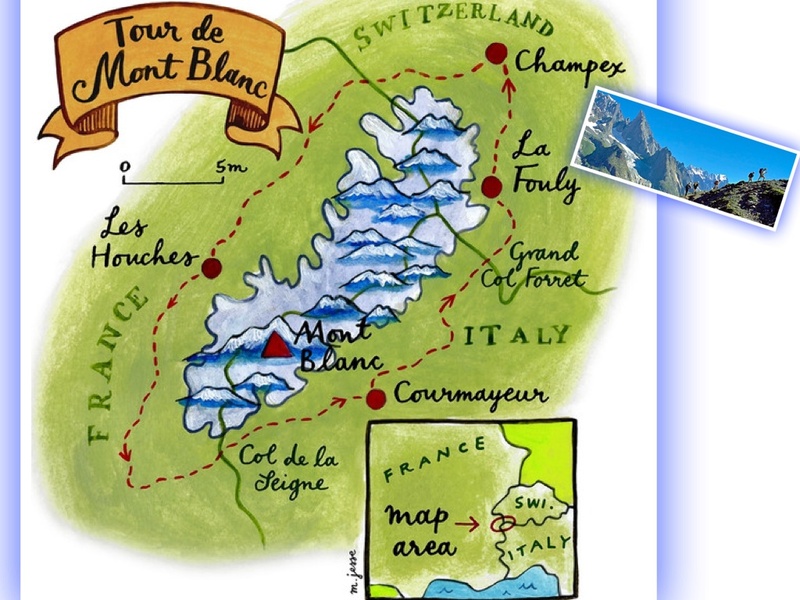 I recommend getting the book, “Tour of Mont Blanc – Complete Two Way Trekking Guide,” by Kev Renolds. It will be your bible. Along with maps and elevation charts, it breaks down the TMB in eleven stages, detailing the terrain, distance, estimated hiking time, route alternatives, sleep and food options. If logistics make your head spin, there are many adventure travel companies you can join that run small group tours or who will plan an independent itinerary for you. Or you can do it yourself, as we did. Below is a breakdown of our 9 days on the TMB. The good news about starting in Courmayeur, Italy, is that you get one of the harder climbing sections out of the way on the first day. The bad news, you are getting one of the harder climbing sections on your first day - with a full pack. Ours each weighed about 30 pounds. We followed the yellow TMB trail markers through the mountain town, up a road and into the woods and onto a dirt path. Ascending switchbacks, that seem to go on forever, we eventually come out onto a balcony trail. Traversing colorful meadows, full of wildflowers, the presence of Mont Blanc, on your left (if going anti-clockwise) is stunning. 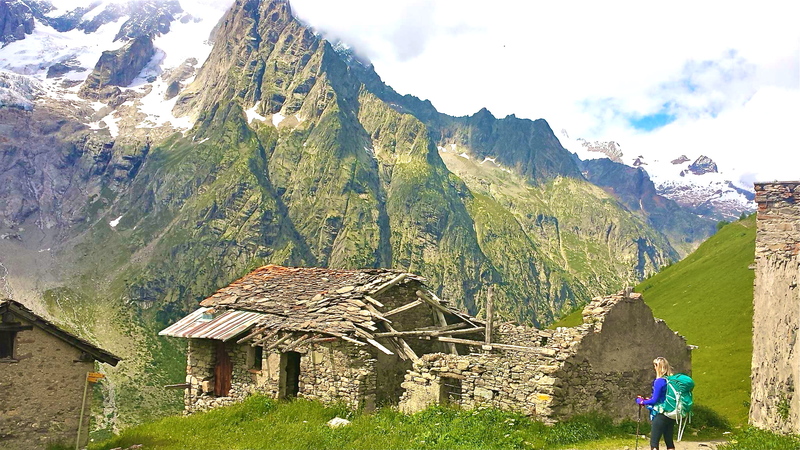 We pushed passed the recommended stop at Refugio Bonati, continued another 6 km and descended into Val Ferret. The weather was beautiful and with no campgrounds in sight, we discreetly set up our hammocks in the trees, off the trail, cooked dinner and slept. The next morning, we hiked up and out of the valley, to the Grand Col de Ferre (2537 m), and into Switzerland. The views were spectacular, from Mont Blanc, glaciers to rolling green mountains and pastures. By late afternoon, we made it to the little town of La Fouly and stayed in a gite, a privately owned inn and hostel. We shared a medium sized dormitory room, outfitted with bunk beds, with three other backpackers. This was going to be an easy day and we planned to crank out more then one stage to keep us on track to finish in 9 days. Then, after an easy 15 km, we saw Champex. It is a picturesque mountain town with an emerald colored lake. Breathtaking! We all know it is important to stop and smell the roses and that is what we did in Champex. We found a bed & breakfast, went swimming and lounged by the lakeside the rest of the afternoon. We would have to make up time later. At the ridge’s summit, a lonely, weathered, colonial, stone house sits. It is here we spent the night at Rifugio of Col de Balme. Rustic, musty and run by a very old French couple, who don’t speak any English, they provided us dinner, consisting of leek soup, salad, omelet and french fries. As the only female backpackers that night, they put us in our own dorm room. Over the ridge and in France now, we worked our way through snowless ski slopes and spent the night at the busy mountain rifugio of Flegere. This one had a large, co-ed dormitory, lined with 20 or more bunk beds. It included dinner and breakfast. A long day of climbing more ski slopes, ladders and rocks, we eventually reached the highest point on the TMB, Le Brevent (8,338 ft./2526 m). At the tourist restaurant on top, we enjoyed a hot lunch of lasagna and spectacular views of Mt. Blanc. Day-trippers either hike or take a cable car from Chaminox up to Le Brevent. It crossed our mind to take the cable car down to Chaminox, thus saving our knees a long afternoon of tedious, jarring descent - but that would have been cheating. Having started at 8am, Tammy and I stumbled into Les Houches at 5pm. Tired, dirty and hungry, we treated ourselves to a 2 star hotel and pizza. After six days of sun, the rains came and stayed. We threw on our ponchos and hiked out of Les Houches onto rocky back roads, forests and into the town of Les Contamines. It rained all day and right before all hell broke lose, we checked into a small hotel. Thunder lighting, strong winds, torrential down pour and flooding lasted through the night. By morning, the storm had passed, but the rains continued and temperatures dropped. Rumors on the trail mentioned flooding ahead. We no longer had time to spare and marched forward. If things were really bad, we would just turn around. Though parts of the trail had become temporary streams, the climb up to this section’s ridge wasn’t to bad. But, right before the top, winds kicked in and the rain turned to sleet. It had become freezing cold and now, slippery. At the small, emergency hut at Col du Bonhomme, we stumbled inside and quickly put on every piece of clothing we had in our packs. Warmer and wanting this cold, wet stage done, back out in the elements we went. Finally, we crossed over and descended into the Valley des Glaciers and into Les Chapieux. Soaking wet and exhausted, we found refuge at Les Chambres du Soleil, a charming, renovated 1867 farmhouse B&B, run by a very sweet, French family. While our hiking boots dried out by the cast iron stove, Tammy and I enjoyed a delicious, home cooked dinner with 16 other guests. Still raining the next morning, we walked along the road out of Les Champieux. The trail led us onto pastures and up into the hills. It must have been the wonderful food and hospitality the night before, because Tammy and I cranked out the last two stages to finish the TMB this day. 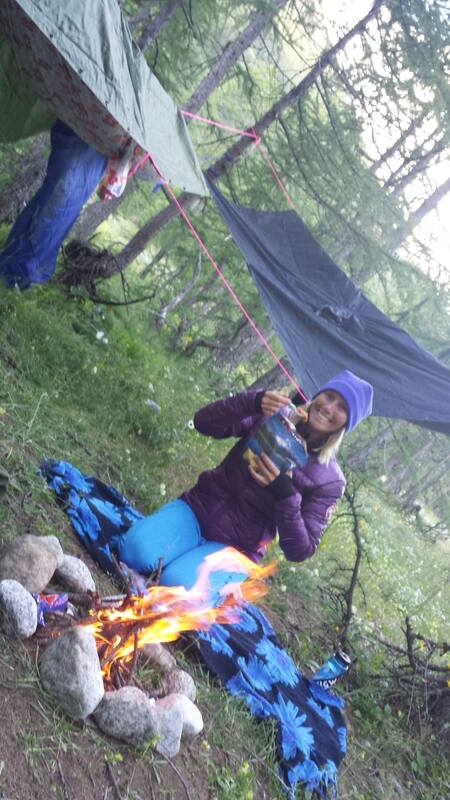 We crossed back into Italy, only stopping for a big bowl of lentil soup at Rifugio Elisabetta. At 7pm, we made it to Courmayeur and finished the TMB in 9 days. 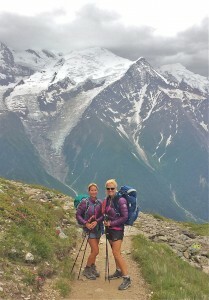 The Tour du Mont Blanc is a beautiful trek and a great way to see three countries.